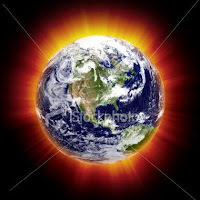 Earth moving massanya encircle the center which is located near the Sun. And Sun together with the entire system is also moving Tata Surya beset central galaxy. Movement of sun in the Milky Way, regularly send the comet appeared to slide into the interior of the Tata Surya. As a result, going large-scale collision that destroy life on Earth. That is the latest research results generated by modeling the latest in Cardiff Center for Astrobiology. In modeling the movement of the simulation is done and found that Surya geraknya appeared to bounce up and down along the field galaxy. When passing through the meeting of the galaxy field, gravutasi style of the area around the cloud of dust and gas giant would change the comet's track. Finally, comet-comet that is tercebur into Tata Surya, and some of them experienced collision with earth. Estimated, Tata Surya will move through the field galaxy every 35 - 45 million years and increases the likelihood of a collision with a comet. Evidence from craters on the earth also showed that the Earth is suffering in the range of collision 36 million years ago. 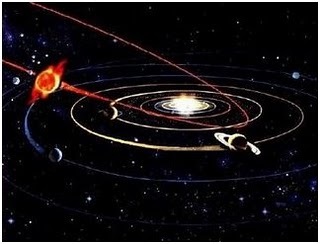 Thus there can be kesesuain gained from the fact that events in the earth with the results of the modeling for the movement of Surya in the Milky Way. Period of collision that occurred on Earth also coincided with the occurrence of mass destruction of dinosaurs 65 million years ago. And if we look at the galaxy's position at this time, so at this time we are already quite close to the same period. If we go back to 65 million years ago, the effect can be the reflection in the galaxy is a nightmare for the dinosaurs, but it turns out that the incident would be the beginning of the distribution of new life. Estimated, the collision-release debris debris containing micro-organisms to the sky and in the entire universe. Many of the new planet be discussed in the virtual world and some books (I have many dibredel) finally truly have! TEAM scientists Kobe University, Japan, found a new planet that mengorbit on the system outside the solar system where Earth is located. Have been many previous saintis would predict the existence of the planet and the resultant disaster of this planet. Period meet some of this planet earth once during the year 3600 (exactly 3661 years). And during each period is recorded as a result grafitasi on this planet bencana2 big going to destroy the earth even peradaban2 large. The year 1650 BC there keruntuhan2 peradaban2 large simultaneously dibarengi emergence of new dg tiba2 also! .. all occurred in 1650 BC. All around the year 3661 ... once! Arrival of this planet's exact year in which the world's most accurate calendar Tzolkin Maya nations also ended the year 2012, precisely 21 December 2012. Maya calendar of the nation known to use than a matter of months and they also take the sun calculation of the planet Venus in pengkalenderan day. Cause the calculation accuracy Maya calendar of the nation in the past than the accuracy of the present calendar (Christian and Hijriyah). Believed by many experts of the nation Maya astronomy have at least the same or even more than the people at this time. Unlike the current calendar Tzolkin calendar has a start and end. Since the first found, extrasolar planet, or exoplanet, or a planet outside the solar hot topic is discussed anywhere and become one of the foremost topics in science. 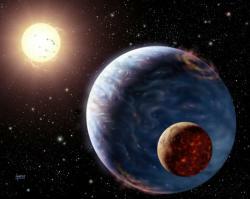 This is strengthened when the type of planet Earth is found in the Gliese 581. This time, 3 exoplanet found by team members Wide Area Search fot Planets (Wasp) and announced in the Extrasolar Planet international conference held in Suzhou, China. Planet-planet has found that Jupiter is a planet seukuran and given the name-3 Wasp, Wasp and Wasp-4-5. Third planet found with the transit method, using super camera in South Africa and the Canary Island of constantly monitor millions of stars in the sky. The findings to be interesting because this team at this time that this is the only team who found the planet with the method of transit to the northern and southern sky. Wasp and Wasp-4-5 is the first planet found in both South Africa and is also a planet transit light most of the sky in the south. While Wasp-3 found in the sky using a camera SuperWASP North in Canary islands. The three are all sized planet Jupiter but mengorbit their parent stars in a very close distance. Even a year will be completed less than 2 days. Time there will not go very fast? Now, with the conditions very close to the parent star, the surface of the planet-the planet will be more than 2000 degrees Celsius, consequences will be very difficult to have life there. But however the discovery of the planet Jupiter bermassa also gave the idea that Earth-sized planet also are waiting to be found, provided that technology is possible. The outside of the Tata Surya still have a lot of planet-planet minor who has not been found. Planet X since the search began in the early 20th century, the planet will likely hipotetis that mengorbit sun behind the Kuiper belt have been burning Calamity theories and speculation that Planet X is actually the brother of our Sun has been "lost." But, why should we be concerned ahead Planet X / Theory of Resurrection this? Planet X is not only an object hipotetis unknown? Theories is also encouraged with the prediction of the tribe of Maya world will come in the year 2012 (Mayan Prophecy) and the mystical story of the Sumerian Nibiru Planet, and the heat now as the "prediction of Resurrection" 21 December 2012. However, evidence that is used for astronomical theories is really melenceng. On June 18 yesterday, Japanese researchers announced news that their theoretical search for a large mass outside the Tata Surya we produce results. From their calculations, it is possible that there is a planet slightly larger than an object Plutoid or dwarf planet, but certainly smaller than Earth, the Sun mengorbit the distance of more than 100 SA. But, before we terhanyut on this discovery, this is not the planet Nibiru, and the evidence is not of this world will end in 2012. These findings are new and is a very interesting development in the search-planet minor planet in the Kuiper belt back. In theoretical simulation, two Japanese researchers have concluded that the outermost part of the Tata Surya our planet that may have not yet been found. Patryk Lykawa and Tadashi Mukai of Kobe University have published their paper in the Astrophysical Journal. Paper describes their minor planet believe that they interact with the Kuiper belt is the mysterious. Kuiper belt region occupies a very knowledgeable in our Tata Surya, approximately 30-50 SA from Sun, and contains a large number of objects rock and metal. The object is known to be the largest dwarf planet (Plutoid) Eris. Has long been known Kuiper belt has a strange characteristic, which may indicate the existence of an object (planet) mengorbit a large sun behind the Kuiper belt. One of the karakterikstik is called the "Kuiper Cliff" Kuiper cliff, or that there is a distance on the SA 50. This is the end of the Kuiper belt is suddenly, and very few of Kuiper belt objects have been observed can be behind this point. This chasm can not be linked to the orbital resonance with the planet-planet masif as Neptunus, and does not appear to be an error occurred (error) observation. Many experts believe that the astronomical end abruptly in the Kuiper belt population can be caused by a planet that has not been found, which may be as much as Earth. The object of this is believed to Lykawka and Mukai, and take into account their existence. The researchers predicted Japan is a large object, a 30-70% mass massanya Earth, Sun mengorbit on the distance of 100-200 SA. Objects may also help explain why some objects and the Kuiper belt Trans-Neptunian object (TNO) has some of the odd orbital characteristics, such as Sedna. Found since Pluto in 1930, the astronom other objects have been looking for a more masif, which can explain the interference observed in the orbital orbit Uranus and Neptunus. This is known as the "Search Planet X," which meant literally as a "search the planet that has not been identified." In the 1980s this orbital interference is treated as an error (error) observation. Therefore, the scientific search will be Planet X today is the search for Kuiper belt objects are large, or minor planet search. Although Planet X may not be the mass of Earth, the researchers will still remain interested to find objects Kuiper others, which may seukuran Plutoid, may also be slightly larger, but not too large. "The interesting thing for me is the suggestion of the kinds of very interesting objects that may yet await discovery in the outer solar system. We are still scratching the edges of that region of the solar system, and I expect many surprises await us with the future deeper surveys. "- Mark Sykes, Director of the Planetary Science Institute (PSI) in Arizona. So, from where comes this Nibiru? In the year 1976, a controversial book entitled The Twelfth Planet or Planet Both are written by teens Zecharian Sitchin. Sitchin has been to translate the writings of the ancient Sumerian wedge-shaped (writing the most ancient known). The note was 6000 this year revealed that the alien race known as the Anunnaki from the planet called Nibiru, landed on Earth. Concise stories, Anunnaki Primate modifying genes in the Earth to create homo sapiens as their slaves. When the Anunnaki left Earth, they let us rule this Earth until the time they return later. All this may appear a little fanciful, and perhaps also a little too detailed when considering all of this is the literal translation of any posts from the ancient age of 6000 years. Sitchin this work have been ignored by the scientific community as method of interpretation are considered imaginative. However, many also heard that Sitchin, Nibiru, and believes that (with a very orbitnya in girth eksentrik Sun) will be back, probably in the year 2012 for all the destruction and terror, terror in this Earth. From "discovery" astronomical doubts that this is hypothetical of Resurrection 2012 Planet X is based. Then, how Planet X is considered as a manifestation of Nibiru? Then there are the "brown dwarf discovery outside Tata Surya us" from the IRAS in 1984 and the "NASA announcement will bermassa 4-8 mass planet Earth is in the Earth" in the year 1933. The hypothetical support of Resurrection is dependent on the discovery of celestial, and as proof that Nibiru is Planet X which has long sought the astronom during this century. Not only that, by manipulating the facts about scientific research, they "prove" that Nibiru we're the (Earth), and in the year 2012, this object will enter masif part in the Tata Surya us, cause interference gravity. Pendefinisian in the most pure, Planet X is a planet that has not been known, which may theoretically mengorbit Sun far behind the Kuiper belt. If the discovery of a few days ago that eventually leads to the observation on a planet or Plutoid, this will be a remarkable discovery that helps us understand the evolution and characteristics of the outer mysteriously Tata Surya us. The atmosphere is a system that is Dynamic, so the observation that data quality and maintenance of Network observation density is very important. Processes that lead to climate change can be analyzed with different time scales, and radiation or net available energy dipermukaan earth is very involved in the process. Basically, the condition of energy dipermukaan divided over 2, the input radiation and the sun and how the components editor components to save the earth, distribute and release the energy. External causes of climate change Input direct sun radiation; Radiasi play an important role in climate change. Through observation satellite is known that the constant sun at this time to become more varied from the previous. One factor is the cause of black spot sun (Sunspot). The more the number of sunspot radiation output of the sun also rises. Human activity causes climate change. * Year of 1900s is a decade terhangat in the last millennium, and 1998 is the year's most warm during this period. * On daeerah Tropical and subtropical trends in climate change is quite small. Although there is a drought in Africa and India in the Rainy Monsunal that last a long time, but not linier pattern found in most tropical regions have increased amount of rainfall. Global warming is the increase in the average temperature of the Earth's near-surface air and the oceans since the mid-twentieth century and its projected continuation. Global surface temperature increased 0.74 ± 0.18 °C (1.33 ± 0.32 °F) during the 100 years ending in 2005. The Intergovernmental Panel on Climate Change (IPCC) concludes that anthropogenic greenhouse gases are responsible for most of the observed temperature increase since the middle of the twentieth century, and natural phenomena such as solar variation and volcanoes probably had a small warming effect from pre-industrial times to 1950 and a small cooling effect from 1950 onward. These basic conclusions have been endorsed by 30 scientific societies and academies of science, including all of the national academies of science of the major industrialized countries. Climate model projections summarized in the latest IPCC report indicate that global surface temperature will likely rise a further 1.1 to 6.4 °C (2.0 to 11.5 °F) during the twenty-first century. The uncertainty in this estimate arises from the use of models with differing climate sensitivity, and the use of differing estimates of future greenhouse gas emissions. Some other uncertainties include how warming and related changes will vary from region to region around the globe. Although most studies focus on the period up to 2100, warming is expected to continue after 2100, even in the absence of new emissions, because of the large heat capacity of the oceans and the lifespan of CO2 in the atmosphere. Increasing global temperature will cause sea levels to rise and will change the amount and pattern of precipitation, likely including an expanse of the subtropical desert regions. Other likely effects include Arctic shrinkage and resulting Arctic methane release, shrinkage of the Amazon rainforest, increases in the intensity of extreme weather events, changes in agricultural yields, modifications of trade routes, glacier retreat, species extinctions and changes in the ranges of disease vectors.